If your hard drive stores a large number of files, folders and applications it can be very difficult to search for specific items to receive results quickly. 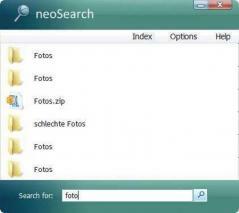 If you frequently search through the contents of your hard drive, neoSearch is a simple utility that can speed up the search process to deliver instant results. The tool runs in the system tray, and you can open up its main window from the related icon. From there, you can enter your search keywords in the dedicated field, and the results will be displayed right away. The graphical layout is simple, yet modern so all users (regardless of their experience) can work with neoSearch. The application will quickly scan your computer and index all the files stored on your hard drive so you can look up specific items and get instant results. Also, it offers the option to add or remove folders from the search index and uses very little system resources so there’s practically zero impact on system performance. However, you should know the list of search results only shows the top six items and the provided information is resumed to thumbnails and the file names.